The disc florets of tansy are grouped into flower-like heads, its leaves are similar to pinnate fern leaves. It often grows close to human settlements, on dry shore banks, alvars, growing up to a metre tall. An ornamental plant that was brought here long ago as a medicinal herb, naturalised by now; it is not used for its former purpose any longer. 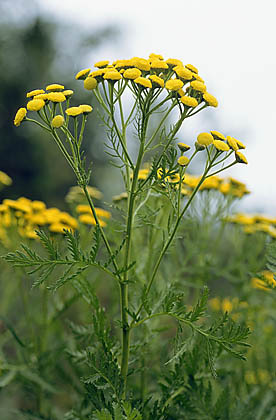 Modern medicine does not recommend using tansy. The Estonian name soolikarohi, "gutwort", implies that it was used to get rid of intestinal parasites. Rubbed between your fingers the plant gives off a strong aromatic smell of camphor, reminding of the smell in sickrooms.